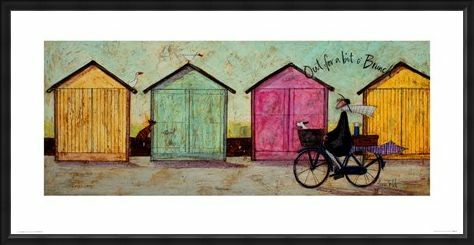 Art Print: Mr Ernest Hemingway is out on yet another adventure with his trusty Jack Russell, Doris in this gorgeous print by British artist Sam Toft. 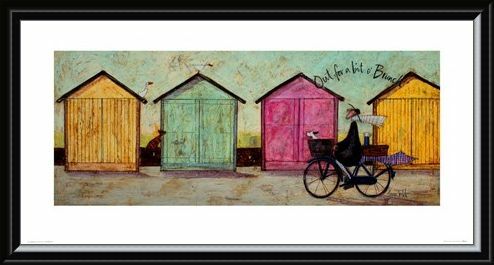 Aptly titled 'Out For A Bit O' Brunch', Ernest can be seen cycling along the prom with a picnic blanket and basket full of goodies securely attached behind. As he passes by a series of colourful yellow, pink and green beach huts, this will create the perfect summer's scene in your home. 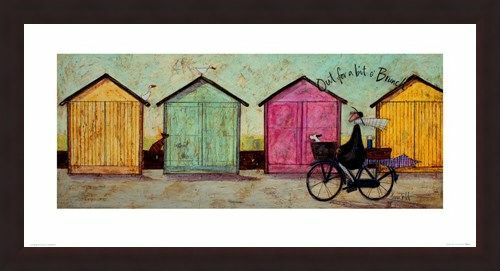 High quality, framed Out For A Bit O' Brunch, Sam Toft print with a bespoke frame by our custom framing service.